Put three people in a room, and the debate will be fierce. In fact, I’d put money on it coming to blows within about ten minutes. “Sacré-Cœur!” one will exclaim loudly. “No! Notre-Dame!” will shout another. And so it came to pass that on our final (half) day in the capital city of Paris, we had just enough time to go and visit that most iconic of iconic Parisian landmarks. 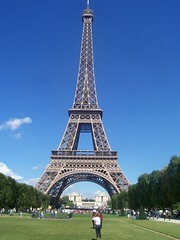 The wondrous Eiffel Tower. It was still relatively early when we arrived at around 9:30. We would have been early had we not got all the way to the station to find RER line C was closed for engineering works, which resulted in a bit of a diversion and various faffing around with the Metro. But we got there, and dutifully joined the queue of people waiting to by tickets. And waited. And waited. And waited. And after an eternity, we got near the ticket window. And I bought some tickets. Then we waited some more. Then we got invited to proceed towards the lift. Then we waited next to the lift. Then we waited on the lift. And then we set off up to the second floor. Well actually… it is! Cos you’re going up a famous landmark, and it’s a bright and sunny day with few clouds which means you’ll get some great views and some fantastic photographs! Result and no mistake! Woo! And so, we got off at the second floor and headed towards the second lift which would take us to the top. And we waited. And took some photographs. And waited some more in one of two queues which joined into one. But then finally we were close – this close to getting into the inner sanctum of the lift waiting area – until some Japanese tour guide decided to tell all her charges in the other queue to link arms and force their way through as one group. At first I’d thought it was a family not wanting to split up, but it some became apparent that this was not the case. Which resulted in me deliberately forcing my way through them. Cos hey, they were trying to jump their natural place in the queue and if there’s anything a Brit doesn’t like, it’s people who jump the queue. Needless to say we got there in the end, and the views were frankly stunning. Although we hadn’t seen the view from the top of Notre-Dame, I decided I was firmly in the Eiffel Tower camp when it came to comparing it to the view from Sacré-Cœur. Yes, Sacré-Cœur may be free, and a hell of a lot quicker to get to see, but everything from there just seemed to blur into one – an endless stream of grey buildings, quickly turning into blobs. 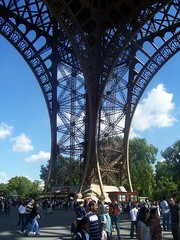 The Eiffel Tower on the other hand, offers landmarks a plenty – bold as brass. The Arc de Triumph. 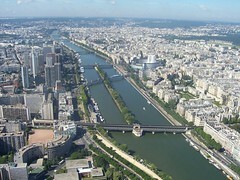 The Seine. All nearby and visible. if you look hard enough, even Notre-Dame. 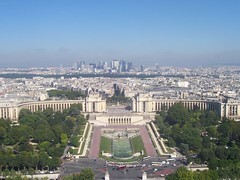 Sacré-Cœur as a view offers the city of Paris, but the Eiffel Tower offers the attractions of Paris. 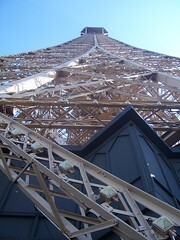 We didn’t dawdle too long at the top of the tower – I still wanted to see more of Paris before we caught our train back. We stayed long enough to take it all in, then headed back down (more queuing) – avoiding the Eiffel Tower Exhibition and other delights. Part of me fancied walking down all those steps to the bottom. But better judgement prevailed. Down at the bottom, in the Champ du Mars, it was time for more of the statutory tower photographs before we left and walked back in the vague direction of our hotel, taking in a few more sights as we walked. 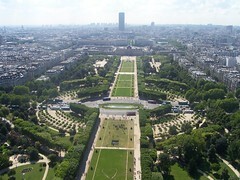 The original plan was to pop to the Arc de Triumph, then stroll down the Champs Elysées. 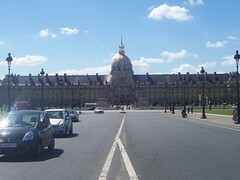 However arriving at the tower late had put pay to that plan so we kept on the left bank and after a bit of a walk, and stopping off in a small supermarket to get some sugar based presents for people at work, we found ourselves at the backup plan – Des Invalides. This dramatic building sits majestically at the end of a four lane road – the Esplanade des Invalides. Now a hotel, it was built as a hospital for wounded soilders in the distant past. 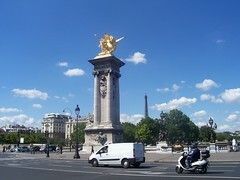 It was also very close to another landmark – Pont Alexandre III – a bridge with columns at each of its corners. The columns were each topped with gold statues. On the other side of the bridge, the glass roofed majesty of the Grand Palais. It reminded me of St Petersburg for some reason. Something to do with it being a bridge and a lot of gold probably. Indeed, it turns out it was named for Czar Nicholas II’s father, to seal Franco-Russian friendship. 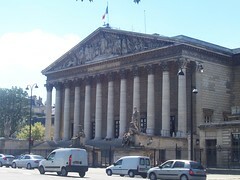 From there, we walked past the Assemblee Nationale, before turning away from the Seine up the Boulevard Saint Germain, slowly but surely in the direction of our hotel. We’d packed up first thing that morning, and all that was necessary now was to pick up our luggage and head towards the Metro station and head towards Gare du Nord. As ever, we’d left plenty of time – too much time – so got to “enjoy” the wonders of Gare du Nord’s ridiculously small waiting area, sitting on a hard floor munching baguettes from the only sandwich stall – someone having decided that magazines and CDs were in greater demand than food and seating… Meanwhile the business class section was near empty. But hey, who cares about passenger comfort if you’re in steerage? Anyway, it was depressing for other reasons. Soon it would all be over. Within a few hours we’d emerge back in the United Kingdom of Great Britain and Northern Ireland. Back to our house. Back to work. Back to bills. Back to hassle. Well maybe just one more pastry before we return to reality. And perhaps a beer… Ah, holidays. Don’t you wish they never ended? why are the pics blocked at our school because i need a pic and there blocked,,,,?*?*?*? and i need the pic 4 school!*!*!*! Your school has probably blocked them.